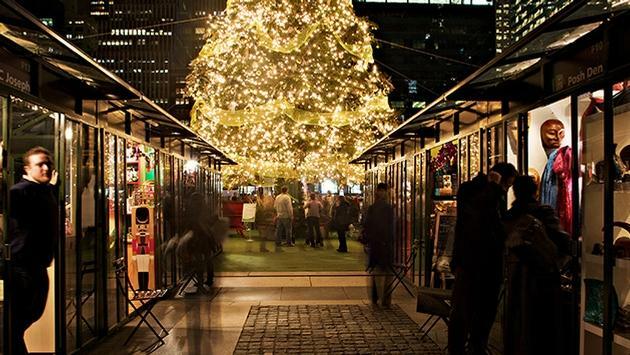 Get your holiday shopping done in Bryant Park. With the holidays in full swing, New York City is making it easy to find and enjoy a well-rounded retail experience with a guide to shopping in the city as well as to the best holiday displays, events, festivals and markets. The new “True York City” campaign is all about discovering the lesser-known areas of the city, and it makes sense that a robust new guide covers iconic shopping destinations as well as New York’s hidden holiday treasures. “‘True York City’ is all about highlighting the authentic New York City, from the well-known to the lesser-known, all ‘Famous Originals.’ New York City’s shopping scene offers visitors and locals incredible variety—from our iconic department stores to unique museums gift shops to artisanal holiday markets and beyond. NYC & Company invites visitors and locals to discover the five boroughs’ unparalleled retail opportunities this holiday season,” said NYC & Company president and CEO Fred Dixon. One of the city’s most alluring holiday traditions in the retail space is its window displays. Tiffany & Co also has a history of creating notable designs in its windows. This year, the jewelry brand is celebrating long-term holiday window display creator, Gene Moore, with reinterpreted designs. New York City has launched an entire guide to holiday window displays around the city. This information is accompanied by several other holiday guides to assist visitors who have come to discover lesser-known parts of the city and the authenticity of the season. Together, the guides highlight things to do, shopping, arts and culture, attractions and restaurants with special holiday attractions and events. Featured content includes information on holiday events, a holiday gift guide, where to find the best holiday markets and performing arts events, as well as the best restaurants for the holidays and more. For those looking to visit New York during the wintertime, they can save money on hotel stays just after the holidays.